Welcome to the Tivoli Inn & Suites Elk Horn, Iowa the ideal location for your next stay, whether you're traveling for business or pleasure. Guests can relax in our inviting, indoor pool and hot tub or our cozy fire-lit lobby. Stay connected with our free, hotel-wide, high-speed Internet and enjoy our free, hot, home-style breakfast and every evening from 3:00- 8:00pm the front desk offers a warm Otis Spunkmeyer. Also, Electric car drivers will enjoy our electric vehicle charging station. While in Elk Horn enjoy shopping on our lovely Main Street which offers a variety of products sure to please everyone. Stop in the Danish Countryside Vines and Wine and experience a tour and wine tasting. Whatever brings you to Elk Horn, you will be glad you stayed and enjoyed the hospitality of our town, its people and Tivoli Inn! 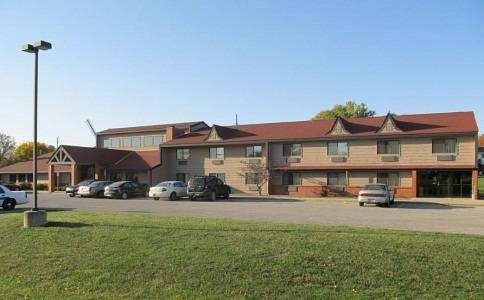 The Tivoli Inn & Suites Elk Horn is conveniently located just 6 miles north of Interstate 80 off exit #54 in the beautiful Danish Villages. We are the perfect hotel between Omaha and Des Moines for meetings. A wee house of worship that seems even smaller when compared to the nearby windmill. < 1 mile from Elk Horn. ~46 miles from Elk Horn. ~48 miles from Elk Horn. A gazebo marks the spot where our 38th President was born, and displays some Gerald R. Ford mementoes, such as his golf clubs. ~52 miles from Elk Horn.